We have to admit the fact that things are looking blue for physical DVD. Even if it'll not go away, but it's dropping off indeed. For one thing, that's because the impact of streaming HD and 4K ultra HD videos, which can be played on various platforms or devices with enhanced quality rather than on DVD players or drives only. For another, the physical DVD itself would take too much space for storage and it's easy to get scratched. Therefore, it's reasonable that you'd like to make a lossless DVD rip to HDD, so as to reserve the original quality of DVD and free up storage space, prevent scratches or damage, and get it playable on mobiles, computers or TVs. Is the Handbrake Lossless DVD Rip Really Without Loss? Many of you may have used Handbrake to rip DVD with lossless quality by sliding the Constant Quality to 0, and you will get a "Warning: RF 0 is Lossless!". Or you'll get to know x264 is lossless at RF 0 when you hover the mouse on the module under the Constant Quality. But does it's really no loss of quality? That may not the case. Lossless x264 will make the digital video much bigger as you are decompressing the MPEG 2 video (~55 GB/hr) then compressing those frames losslessly (to maybe 20 GB/hr), but you're still re-encoding the DVD. A lossless rip of the DVD is making a transfer to the HDD and the data is as it was, no encoding or conversion. In other words, to rip DVD losslessly, you can make a backup of DVD to ISO image, MKV, Video_TS Folder, but with the original MPEG2 codec reserved. Try MacX DVD Ripper Pro - The Best Lossless DVD Ripper! Envelop DVD main movie to single MKV with all subtitles and audio streams included, so that you can alter them when you're watching your DVD movies. Back up DVD full title copy so that you can reserve all info, like chapter info, sub-chapters, titles, multiple audio and video streams, subtitles, etc. Rip DVD to main title with selected audios and tracks, which will save storage space greatly as it only retains thevideo, subtitle and audio you desire. 1:1 copy DVD to ISO image for a full clone, solving all your problems of playing DVD on a modern computer without a disc drive. Convert DVD to HEVC with re-encoded, but merely no quality loss and half file size compared to H.264 codec for enjoying on Android, iOS, smart TVs. It's note worthy that with the hyper-threading, multi-core CPU and the unique level-3 hardware acceleration tech, you can make maximum use of CPU and GPU, and get the utmost speed for DVD ripping, merely 5 minutes only to rip a full DVD. Now download the lossless DVD ripper, install and run it to rip DVD intactly with the following steps. Step 1: Load NTSC/PAL DVD movie. After you launch the program, click "DVD Disc" to load the DVD you've inserted to the DVD drive. ISO image and DVD Folder are also available. You can also drag and drop the target DVD to the program to import the DVD movie. Step 2: Choose lossless DVD output. After you've done, there pops up an Output Profile window automatically. Go "DVD Backup" to choose lossless profiles. You can choose among Main Movie Content Copy, Full Title Copy, Full Title MKV, ISO image with original MPEG2 codec. If you're willing to do some editings about your DVD movie, you can click the "Edit" button to adjust the audio volume, add external .srt subtitles to DVD, trim the output video length, crop the aspect ratio to fit kids of screens, and rotate or flip videos. Step 3: Start ripping DVD without loss. Tap the "RUN" button at the lower right corner of the panel to start the lossless conversion from DVD to MKV, ISO Image, or MPG with multiple audio tracks and subtitles preserved. The process will be accomplished in a very few minutes, yet the amount of accurate time varies depending on your output settings, the speed of your computer, and size of the DVD. Note: This DVD ripping software is the first one that allows unique level-3 hardware acceleration. That is to say, if your computer is build with hardware acceleration supported processor or GPU (Check the detail demands on CPU and GPU chips for hardware acceleration), MacX will invoke the Intel QSV/Nvidia/AMD hardware acceleration technology to speed up the DVD ripping process, by up to 5 times faster than others. Disclaimer: The software developer calls for copying or ripping DVD under the concept of Fair Use and does not encourage any illegal reproduction or distribution of copyrighted content. Please abide by the local DVD copyright law before doing it. 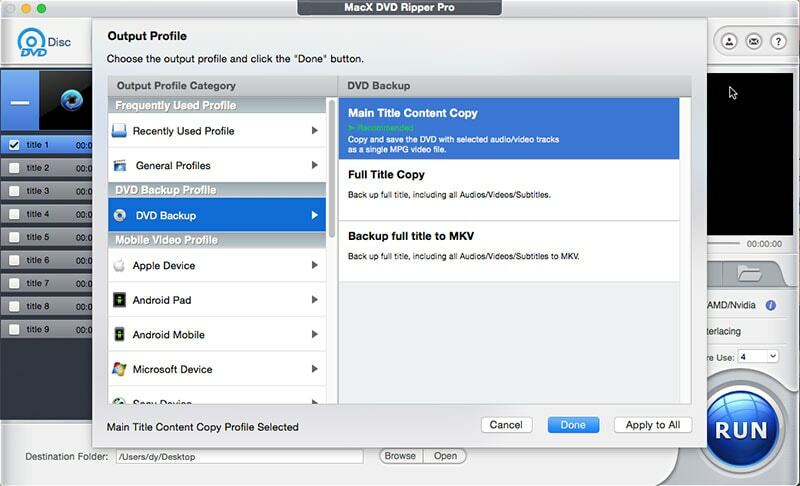 Best lossless DVD ripper - MacX DVD Ripper Pro enables you to freely rip DVD discs to ISO image, MKV, MPG without re-encoding MPEG2 codec and 5.1 channel AC3 audio. It's also available to rip DVD to MP4, H.264, HEVC, MPEG4, MOV, MKV, WMV, AVI, FLV, etc with high quality and GPU HW accelerated speed. Any DVDs are accessible, like newly released DVDs, 99-title DVDs, scratched/unplayable DVD discs, workout DVDs etc.